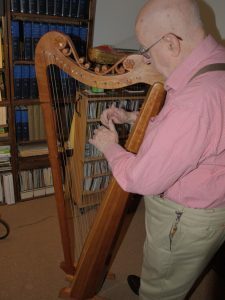 Sam has owned a lot of harps during his long career as a harpist and harp technician. In his retirement he’s fallen completely in love with renaissance and medieval harps. 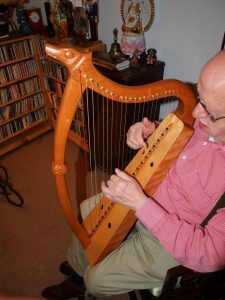 He presently owns a Lyon & Healy semi-grand, several Clark Irish harps and four reproductions of historical harps, built by Lynne Lewandowski. All Sam’s harps are totally strung in gut. He is a firm believer that if the Good Lord had meant for us to string our harps with Nylon, sheep would come with plastic innards. This harp is based on a miniature illustration in the Escorial manuscript of the Cantigas of King Alfonso X, El Sabio (1221-1284). The range is from C-2 to C-4. The harp is 34″ high. The older Sam gets, the better he likes it. While this is a Spanish example, its use was common all over Europe. The Gothic harp is reproduced from a painting by Hans Memling (1433?-1494), in which it is played by an angel. It is probably familiar from hundreds of reproductions on Christmas cards. The range is from C-2 to F-5. The harp is 45″ high. It is characterized by slender elegance. This harp is a copy of a South American original from Tópaga in Colombia. The range is four octaves, from C-2 to C-6. It stands 59″. Ordinarily this instrument is played while standing, with the hands placed fairly high in the strings. The unique fretwork on the neck is characteristic of the time and place. This type of instrument was found all over the hispanic world in Renaissance and Baroque times, from Spain to Manilla, and from Texas to Patagonia. This is an Irish harp made by Lyon & Healy for the Clark Music Company of Syracuse, New York. 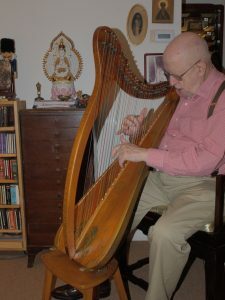 Most Clark harps have straight sounding-boards, but a few (such as this one) have extended boards, which Melville Clark called the “baby grand” model. At first, the idea seems grotesque, but it actually looks rather elegant. The range of this harp is from G-1 to E-6. The bottom five strings are compound wire. The harp is 39″ high; mounted on its detatchable legs it stands at 51″. 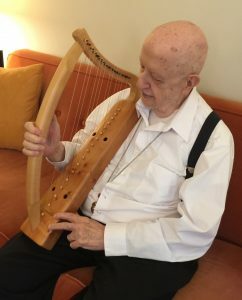 This harp is very similar to Sam’s first harp, which his father bought from the nuns at Our Lady of the Lake College in San Antonio, Texas. 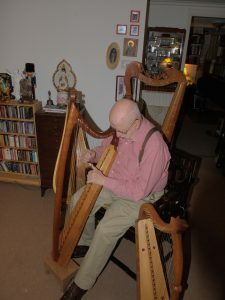 In finding suitable literature for the instrument, young Sammy put together a repertory which formed the nucleus of Medieval to Modern, his first collection for the Lyon & Healy Troubadour harp in 1961. The semitones on these Clark harps were made with the use of blades which turn toward the string to raise the pitch one half-step.